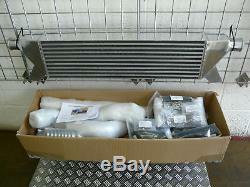 Airtec - Stage 2 Focus RS MK1 Front mount Intercooler kit with 100mm core. Why do I need a front mount intercooler kit? The original charge cooler kit works o. On standard cars but on modified cars with increased boost etc the water temps in the charge cooler can't cope and start to climb to scary levels which can cause your ACT's (Air charge temperature) to rise to over 55+ degree's (on our test they kep't climbing to well over 55 on charge cooler system) leading to power loss & possible engine damage, by fitting a Front mount intercooler these ACT's are kept well below the safe 50 degree mark, which in turn will help your engine produce more power safely (please see ACT's results below). This kit will take you approximately 4-6 hours to fit and can be carried out at home, there is no cutting, grinding or welding & you dont need to turn your turbo housing with this kit. Airtec 100m core Focus RS intercooler Alloy boost pipes Roose Motorsport Silicone hoses (available in drop down box) please choose from options Full stainless steel jubilee clips for silicon hoses Alloy Battery relocation tray with battery clamps Step by step fitting Instructions No other parts needed we provide every bolt, nut you will require. (Please note this kit has been designed to use k&n gen2 or similar and original airbox can not be used). Before Intercooler was fitted the car made only 262bhp & 306 lbs/ft. Act drops (Air charge temperature) Inlet temp (going into intercooler from turbo) 158 degree's Outlet temp (coming out of intercooler going to inlet manifold) 25 degree's Yes 25 degree's'thats a 133 degree drop in act' simply amazing. Please remember our car has standard Turbo & manifold and this kit will work even better fitted on cars with after market manifold's and turbo's. The item "Airtec Stage 2 Focus RS MK1 Front mount Intercooler kit with 100mm core. Silv" is in sale since Saturday, November 21, 2015. This item is in the category "Vehicle Parts & Accessories\Car Parts\Turbos & Superchargers\Intercoolers & Parts". The seller is "roosemotorsport" and is located in Lincoln. This item can be shipped worldwide.